In many of today's homes, the kitchen has become the hub of family activities and so efforts are ongoing to make this room ever more functional and friendly. Adding extra square footage, cupboards, and counter space, in any of the innumerable styles available, are common approaches in this pursuit but beyond these basic considerations, one more very practical and decorative element needs to be given serious attention - lighting. The kitchen illumination market is a shining example of purpose and personality blending together to offer an ever-expanding selection of lighting choices. Whether you want to better see the food you're preparing, brighten your daughters homework area, or set the mood for entertaining, lighting in the kitchen needs to be evaluated first for its function, and secondly for its form. 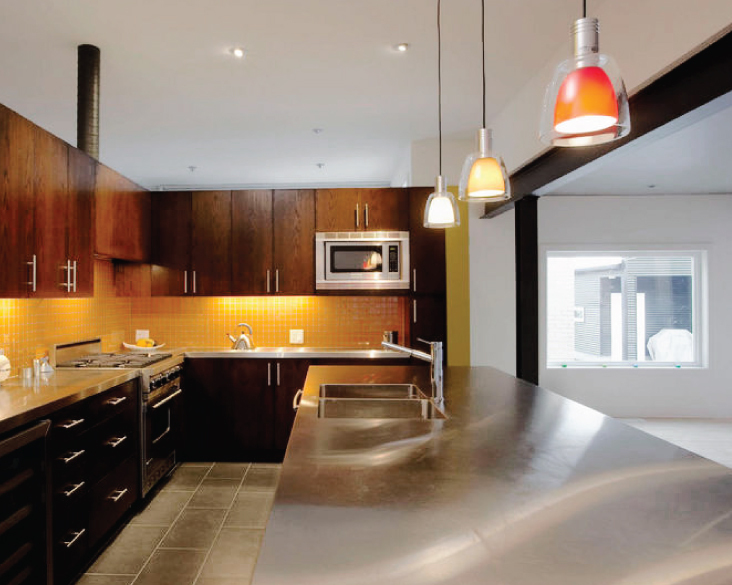 Kitchen lighting functions are typically divided into three general categories ambient, task and accent. Utilizing all three can saturate your kitchen in your own distinctive glow. Lighting forms are even more diverse, as dozens of fixture classes exist and each has an endless number of styles. The overall fill light of the room is referred to as ambient light. During the day, this is usually the natural outdoor light spilling in through windows, glass doors or skylights. In the evening, illumination is typically provided by ceiling fixtures controlled by the simple flip of a wall switch. ears ago, a lone ceiling light was often considered sufficient to light the kitchen but with today's larger designs, ambient light is usually provided by several ceiling devices. If you are in the construction, or re-construction, phase of your kitchen plans, you are still in a position to control the amount of natural daylight that flows in. our kitchens orientation with the suns movement has to be considered, since direct sunlight and shadows can be either a delight or a nuisance. Simply adding or removing, enlarging or reducing windows will control daylight. Doors too, can restrict light or provide a full-glass panel of it. Skylights, when strategically placed, can provide a practical source of light, ventilation, and a feeling of spaciousness. A myriad of choices exist to provide the evenings ambient light. This fixture has always been popular. Extremely simple or drastically ornate, modern or traditional, but always, it is an attraction. The number of lights on a chandelier varies, but typically averages from three to a dozen. Each light bulb can be exposed, have individual stylized coverings, or have its light diffused by one large drum shade. A variation of the chandelier, the pendent usually hangs from the ceiling with a single light. When displayed close to the ceiling, light from pendents can spread out at a wider angle across the kitchen area to provide ambient light. When hung lower, they are typically displayed in groupings for an artistic as well as a lighting effect. A simple, practical source of light in common use for decades. Light is softly spread across the room and easily blends into the decor of most kitchens. Semi-flush mounted fixtures hang a few inches from the ceiling, and depending on their orientation, usually reflect off the ceiling and beam light downward and across the room. For a very discreet look, recessed lighting may be the approach to take. Canister units can be strategically tucked into the ceiling to provide either ambient or task lighting. This has been a fashionable means of lighting for decades and shows no signs of becoming out-dated. Can be recessed or attached to the ceiling surface. By either means the light is usually diffused across the room through some style of screening.